A Day To Think About Food Even More : The Salt An advocacy group says Food Day helps local activists feel connected to a national movement. Today there are more than 2,000 events around to country that will try to spur action around food issues like hunger and nutrition. It's tough to get excited about another awareness day. In case you hadn't heard, October is National Protect Your Hearing Month. Sept. 21 was National School Backpack Day. There is a Hug Your Hound Day. These are all worthy causes, of course, but at a certain point, one wonders whether any good can come from singling out one more day to force awareness on people. Today happens to be the first national Food Day. It's sponsored by the Center for Science in the Public Interest, which got more than 100 organizations on board as partners to run 2,000 events around the country. The goal: To eat well and raise awareness of a long list of food movement issues, such as the benefits of local foods, farm subsidies, the fight against hunger — you get the picture. Sounds nice, but the birth of Food Day does beg the question: Do we really need it to prove that there are a lot of things wrong with the food we eat and the way we eat? Michael Jacobson, executive director of CSPI, says yes, we definitely need a Food Day, and yes, it can be inclusive of all food issues. "A national event like this is tremendously useful to people at the local level," Jacobson tells The Salt. "It helps them feel like they are part of something bigger." And there are some clever people making hay, so to speak, out of Food Day. Take, for example, the Eat Real "Eat In" at Times Square in New York today. 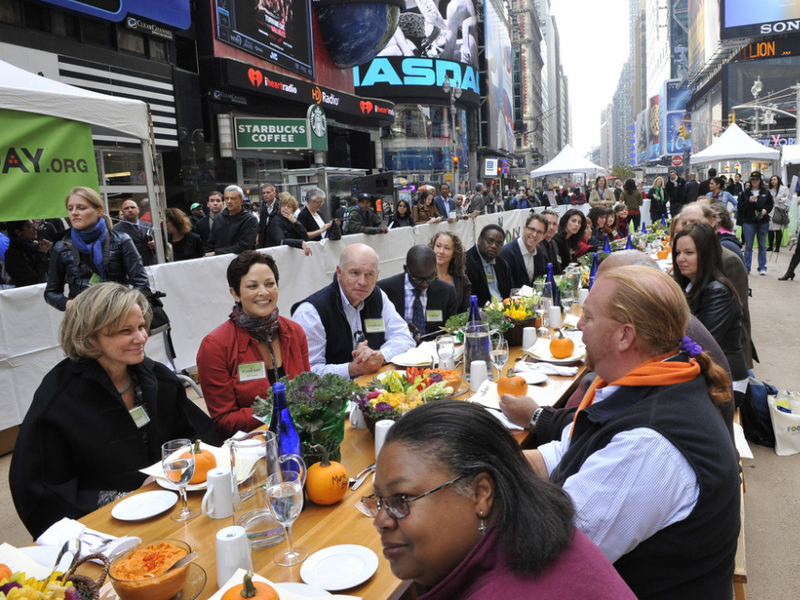 At a communal table set up on Military Island, 50 people (including Mario Batali, Jane Brody of the New York Times, and Morgan Spurlock) are discussing food issues over lunch. This Broadway-style meal will also be ringed with tents with information for the public. The Philadelphia Inquirer reports that Food Day has inspired a "carrotmob" at a small, struggling market that sells fresh produce. The carrotmob is a buycott, instead of boycott, organized through social media. The idea has been around for a few years. Mobsters show up at an appointed place and time to buy food at the shop and then spread the word that it's worth supporting. Patricia Blakely of the Merchants Fund in Philadelphia tells the Inquirer that the carrotmob can be a "viable model for small business development." Jacobson is also excited that all public schools in Bentonville, Ark., will be recognizing the day with a week's worth of classes on food. Some students will create junk food halls of shame in their art classes, he said. Out in California, a group of lawyers and scientists are taking Food Day as an opportunity to get together to talk about food deserts and prison food (hint: it's not very good). The conference is entitled "Food Deserts: Legal, Social and Public Health Challenges" and the panel on Food and Nutrition in Correctional Institutions is sure to be an interesting one. Correspondent Allison Aubrey is in Vienna, Va. today at a Food Day event organized by Real Food for Kids, a group started by parents of Fairfax County school kids. Aubrey says students at Wolftrap Elementary are riding tractors and picking lettuce, peppers and tomatoes at the Maple Avenue Market & Farm. "I think kids are totally willing to be more connected to the food they eat," says mother Laura Cromartie. "They just need to the opportunity."